I am not, by any stretch, a specialist in the First World War, but I did have an experience in lecturing and writing about the war that really brought home to me the importance of how we treat history. Though as historians we often think, write, and teach about history at a distance – it is the past, after all – history can reach through the expanse of time to teach us an important lesson in taking care of history. The second year survey course in Canadian history I teach at Trent University is called “Death in the Peaceable Kingdom: Canadian History since 1867 through Murder, Execution, Assassination and Suicide.” Despite the sometimes gruesome theme, it is a fun course, and students find it appealing as a way to learn and talk about Canadian history. I recently published a textbook of the same title based on the course, which I have discussed at the University of Toronto Press blog. 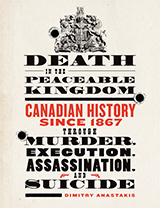 As you can likely gather from the title of the course and book, each lecture or chapter uses the hook of a particular murder, execution, assassination, or suicide to illuminate or illustrate some larger theme, event, or issue in Canadian history. The book also includes a number of additional vignettes which I call “Murderous Moments” or “Tragic Tales” which are short episodes that also address more specific issues or events in Canadian history. Obviously, I cover the First World War, both in the course and in the book (there are actually two chapters in the book, but only one lecture in the course). I don’t recall exactly how or why I picked Private Harold Carter as my case to explore the First World War. I wanted someone who told the “alternate” wartime story – the war as tragedy, a departure from the well-known tales of triumph and heroism of the Great War. My course theme led me to someone who had been executed during the war, as opposed to one who died in combat or from disease. Unlike more familiar names such as Billy Bishop, Arthur Currie, or John McCrae, Harold Carter’s story was one of desertion and, ultimately, execution; likely also of post-traumatic stress disorder. A native of Toronto, Harold was born to British immigrants in 1896, but he lied about his age on his Attestation Records, claiming he was born in 1894. (It’s not known why, since his father was his witness, and Harold met the minimum age). 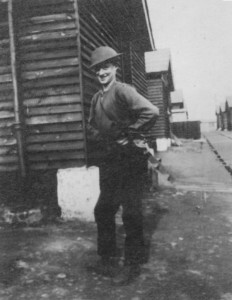 Harold was a young teamster when the war broke out, and like so many other Canadians of British stock, he volunteered. But military life did not come easily to Harold, who must have been something of a reluctant volunteer, or at least quickly realized just how horrible the war was. After having gone AWOL at least three times following his voluntary enlistment in 1915, Private Carter was executed for desertion in April 1917, just a few days after the famous Canadian triumph at Vimy Ridge. Carter’s story provides me with a way to remind students of the tragedy and horror of war, emphasizing that this history is not just about heroes and sacrifice, but also those stories which do not fit the mould of heroism and valour. In my lectures, Harold Carter becomes an important “hook” to explain the war and its consequences; little did I know that he would become much more. My course had been running for a couple of years when, out of the blue, I received a phone call from Colleen Carter, Harold’s great grand niece. She told me that a student of mine had been chatting to one of her relatives about the class and the Harold Carter lecture, and the word was passed along to her that I had used her great-uncle in my course. Colleen was thrilled about this, putting to rest my worries that I had treated Harold Carter’s memory cavalierly, or that it might have been relayed to her that I had said something disrespectful about her long-deceased family member. As we spoke more, I learned that the Carter family had been part of the campaign to ensure that Harold and those other Canadians who had been executed in France were included in the Books of Remembrance that are stored in the Peace Tower on Parliament Hill and contain the names of all those who have served in the Canadian Forces. Those that were executed for desertion or treason were left out of the books until the Canadian government had them added in 2001, the families’ campaign. This brought home to me how very real, and in some ways, alive, Harold Carter was, and how important it was for Colleen and her family to be able to ensure that their relative was remembered as they wished. Unfortunately, I also learned that Colleen was very ill, and we did not speak again after that day, which added to the poignancy of our conversation. I acknowledged her and her family in my book. Sometimes, when we lecture about things seemingly distant, we need a reminder that the past is closer at hand than we realize. Dimitry Anastaskis is a Canadian historian and Professor at Trent University.